Serving predominantly the western suburbs of Philadelphia. It has four acute care hospitals and a number of support services for the local community. In such a fast-moving environment like healthcare, creating an efficient system for Information Technology (IT) communications can be a challenge. 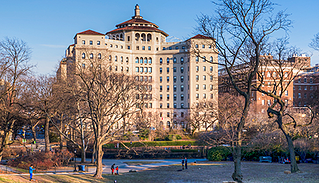 In a large network, such as Main Line Health System (MLH), based in the western suburbs of Philadelphia, the systems and computing infrastructure has a critical need to operate smoothly 24/7. That’s because it supports 10,000+ staff, including 2,000+ physicians, across four acute care hospitals and five health centers. This created a need for more direct IT communications to improve overall performance and keep staff informed of important IT updates. MLH wanted to go beyond traditional communication channels and implement an advanced messaging system. For several years, MLH had used overhead paging - though the noise involved had the potential to disturb patients. It was also found to be an inconvenient method for transmitting crucial system support messages to the staff network. There was concern that employees could miss an important announcement if they were out of earshot. Furthermore, shared workspaces sometimes meant less time available to check emails. A less-than-perfect communication approach meant staff were sometimes out of the loop on critical messages around IT systems and network outages. The team at MLH identified these issues and sought to find the best solution to achieve effective cut-through of their IT messages. 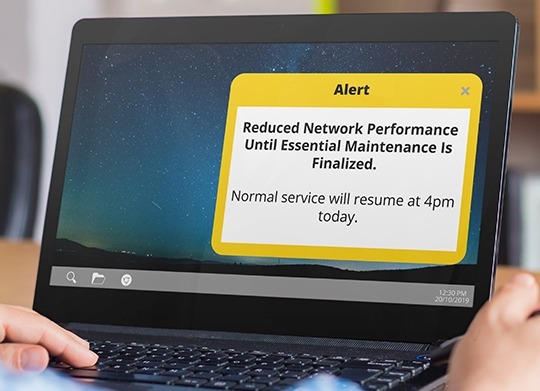 When the network is down, a simple message delivered in the right manner could improve job performance and ensure the Helpdesk resources are better directed to the right tasks. Having identified the importance of an effective method for these communications, and one which would align with the business goal of reducing noise to patients, MLH introduced SnapComms desktop tickers to perform the task of conveying system messages. The desktop ticker is a discreet, unobtrusive way to communicate important messages to a broad audience. It can be set to remain on the screen permanently for a defined period, or until clicked, repeated regularly. This is a particularly effective feature for the shared workspaces at MLH, ensuring all staff (including shift workers) see the message. It displays as a narrow window of scrolling text usually at the bottom of a computer screen. 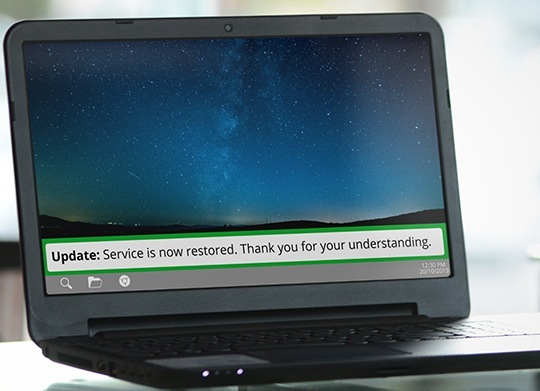 Desktop alerts present as a pop-up window on the user’s computer screen. It has the functionality to carry images, text and hyperlinks, with options to be re-presented at scheduled intervals or set to fill the entire screen for urgent or emergency communications. The desktop tickers are used exclusively by the IT department at MLH to convey all network and system-related messages to staff. As well as providing real-time updates to staff, they are used as reminders for scheduled downtime so staff know when to log out and when systems are back in operation. Steve Czapla, Director of IS Customer Support at MLH, had the idea of color-coding the IT communications they were sending out via desktop ticker. This enables easy message recognition for staff. For example: Red = Unexpected Outage, Yellow = Reduced Network Performance, Green = Service Restored, and Blue = Scheduled Outages/Downtimes. As several staff share workspaces and screens at MLH, SnapComms Tickers (above) are a popular channel choice for broadcasting important messages that bypass email. The desktop alert is used for Capacity Alerts. These high priority notifications are sent to several teams, including nurses, housekeeping and transport. They alert staff that the facility is nearing maximum capacity, and more beds are needed for admissions from Emergency. In such large facilities like MLH, it can be time and resource-consuming to convey this information in person or through phone calls. This information can now be targeted to the relevant workstations and conveyed quickly, and updated as necessary. It facilitates a much smoother, more informed shift handover between staff. With SnapComms introduced nearly four years ago, the system has become an integral part of the organization’s internal communications infrastructure. “Our staff focus groups elicited positive responses about this style of communicating,” explains Czapla. “Additionally, SnapComms has helped create a more direct connection to between the IT team and our colleagues throughout MLH. “Staff now feel reassured that IT problems are being worked on and a resolution is near. They are more aware, better informed and have a reduced need to reach out to the Helpdesk for updates,” adds Czapla. In summary, adopting a more effective IT communications strategy has assisted MLH in delivering on their mission to create a superior experience for team members and patients. Staff now feel reassured that IT problems are being worked on and a resolution is near. They are more aware, better informed and have a reduced need to reach out to the Helpdesk for updates.